Boar is a spinoff of Black Camel, which serves some pretty solid sandwiches. Because of my affection for that place, I’ve been meaning to check Boar out for a while, though I don’t typically find myself near Yonge and Eglinton, so it took a few months to get there. They serve Italian sandwiches like veal, sausage, and meatball, with your choice of various sauces and condiments. I’m a sucker for a good veal sandwich, so I ordered that with tomato sauce and caramelized onions. 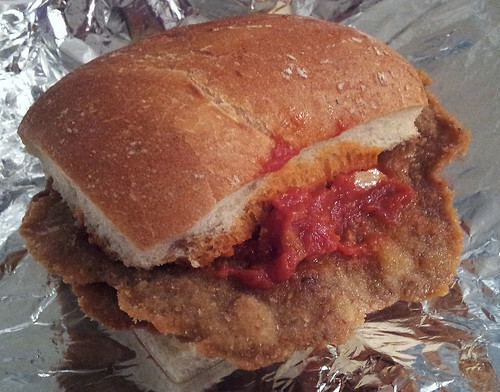 It’s a bit different from the traditional veal sandwich that they serve at a place like California Sandwiches: rather than being dipped in the tomato sauce, the breaded, fried veal cutlet has the sauce spooned on top. These types of sandwiches typically feature a smooth, blended sauce with a fairly mild flavour. The sauce here, on the other hand, is rich and chunky, with the intense flavour of a sauce that’s been reduced to its purest essence. It’s pretty fantastic, and pairs perfectly with the tender, perfectly fried cutlet. The only misstep are the caramelized onions (and that’s my fault, since I was the one who chose them); though they were perfectly cooked and sweetly flavourful, they were a little bit too assertive and just got in the way of the outstanding interplay between the rich sauce and the crispy cutlet. It’s mostly a take-out place, though they do have a small dining room off to the side. 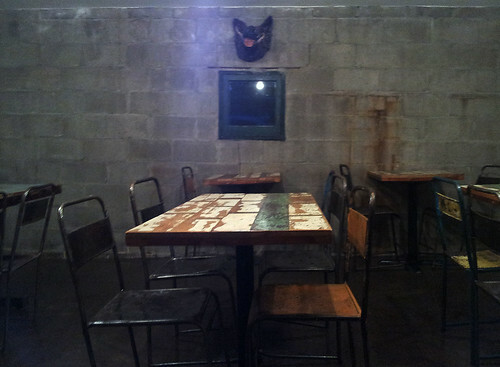 With the exposed concrete walls, the rustic wood tables, and the boar’s head mounted on the wall, it has a vaguely creepy vibe that made me think Leatherface was going to bust in at any moment, chainsaw roaring. But the sandwich was so good that this could have happened, and I still would have called the visit a win.